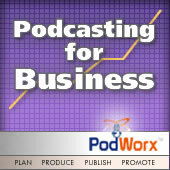 The Podcasting for Business Podcast is a ten-episode podcast that sets out to educate sales, marketing, brand and advertising professionals on what PodWorx, Inc. calls the Four P’s of Podcasting®; that is, how do you Plan, Produce, Publish and Promote your business or corporate podcast. If you’ve come to this page because you want to know how to develop your own podcast, you’ve come to the right place. Each episode gives specific details on what to do (and what not to do) when deploying a successful business podcast. This content is based on host Scott Whitney’s extensive podcasting experience. For those who want to learn how to plan, produce, publish and promote their own podcast, PodWorx’s standard fee for such training is $7500. As you’ll see here, much of this content is provided at no cost. For those premium episodes that are password protected, you may either purchase our Four P’s of Podcasting CD or purchase immediate access to these educational episodes by visiting the PodWorx Order Page.